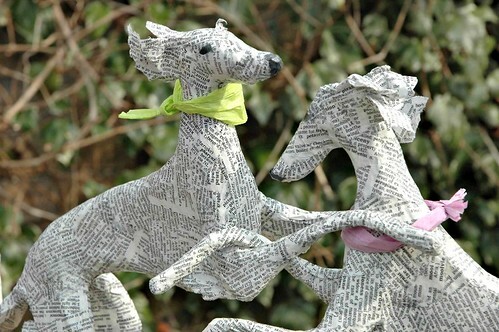 If you're an avid dog lover or even if you aren't, my guess is these playful sculptures can't help but bring a smile. 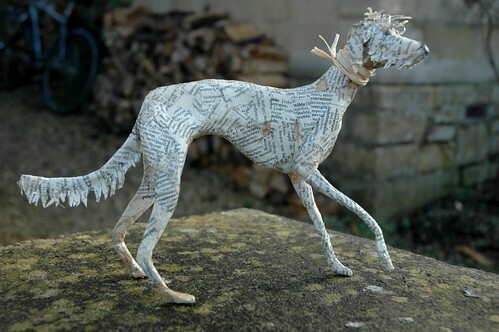 Lorraine Corrigan of Hounds of Bath in England works with wire, papier mâché, and old book pages to capture the delicate features of sighthounds. It was just four years ago that you had the idea to craft dogs by hand. Can you tell us about your previous paper art experience? I have always had a love of sculpting since studying art at level sculpture in school many years ago. I knew I would return to this form of art eventually, but never found the right medium. Five years ago I took a course in art therapy and they gave us wire to play around with... I tried to make a dog ( I adore dogs) and it ended up like a deformed lamb. I still have a fondness for that lamb that I kept! A year later I was running an art group for the homeless and thought why not make papier mâché heads of dogs? In my own time, I began to make whole dogs in papier mâché style. I had at last found my medium coupled with my love for sighthounds. Do you find using old book pages brings a different result than the more typical newspaper? I found that working with newspaper was frustrating as I struggled to represent the fine details; for example, the paper thin ears. By chance I found an old book with fine paper and the rest is history. I could use wire as a framework and this is the exciting bit... finding new positions; then layering, re-layering, and cutting in so that I am sculpting with paper just as a sculptor would with clay. So it's safe to say you're enjoying sculpting and plan to continue? I only started selling my sculptures last November and am overwhelmed by the response. It is early days, but I am so happy to do what I'm doing. I have found my medium, my passion and even writing this now makes me think I really need to be getting on with Esta... an Italian Spinone with incredible eyebrows! 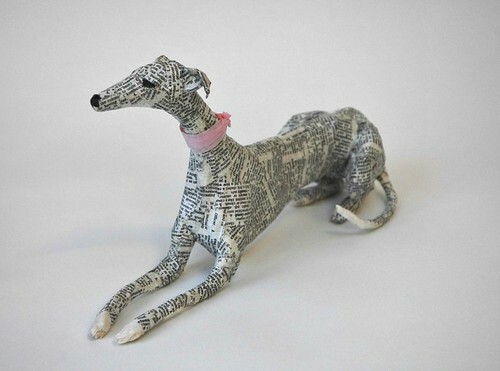 How can people contact you to create a sculpture of their dog? 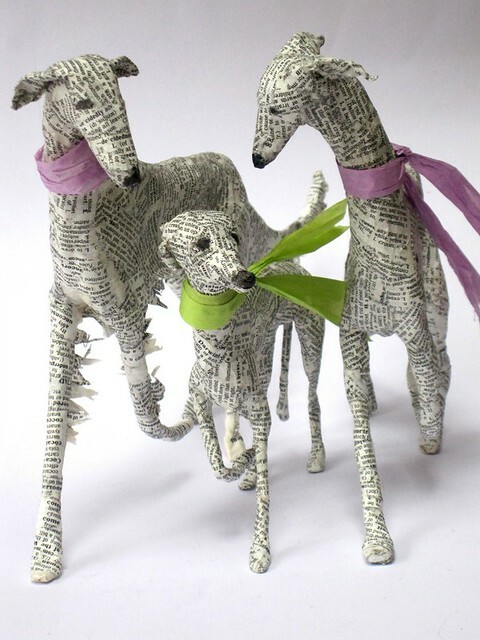 My orders mainly come from Facebook (Lorraine's Hounds) which seems really popular, and from there I refer people to my Hounds of Bath page where there is ordering information. I'm currently working with a month's orders ahead of me. Each dog takes about twelve hours to complete. As much as I love what I'm doing, I really need to recognise all the care and love that goes into each piece and raise my prices accordingly. I find I like working out of Facebook (as opposed to galleries or shows), as it is lovely and satisfying when a new owner sends a picture of the dog on their shelf. As long as the orders continue, this is where my future lies! Amazing and so adorable!! So nice to read her story . All her sculptures have so much character and movement . Really I am in loss of words . Marvelous work! What fun, too! 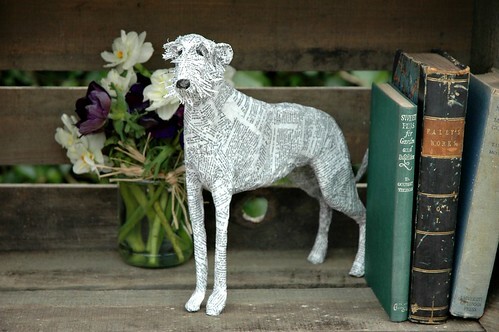 who wants a real dog when you could have one of these paper mache dogs!! !they are too cute and certainly adorable!!! Wow, these are fantastic, I think I just fell a little bit in love with them!! Thank you so much for sharing so many fabulous artists on your blog. I am so enamored with her work ~ liked and shared her facebook page too with reference to your blog. I continue to follow you and so many artists you have shared here on your blog. Thank you for broadening my paper horizons. You're so welcome, my pleasure! Stunning work....any dog owner would be proud to have one!!! I'm so impressed. 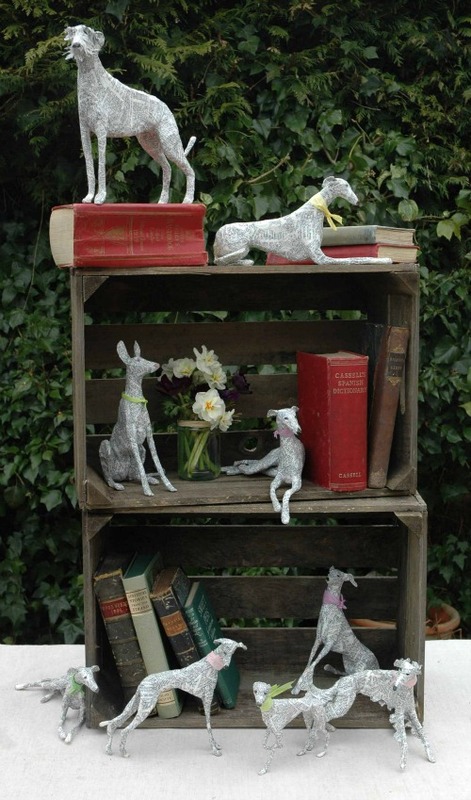 That's so wonderful that she found papier mache as her medium and I like that she uses old book pages for the paper. As a Silken Windhound owner, I must say that the "Dancing Silken Waltz" does capture their spirit, and them playing very nicely. Well done! Wow! I am in love with every one of these gorgeous little works of art.